Plus: kick-start your career, and how to craft better branding, in Computer Arts 260. 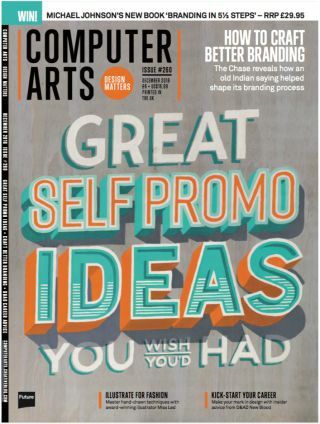 Find out how to create powerful self-promo with the brand new edition of Computer Arts, issue 260, which hits the newsstand today. This month’s lead feature takes an in-depth look at four outstanding self-promotional projects you wish you did (and one you’re glad you didn’t). Packed with pro tips and advice for how to cut through the noise, the feature reveals how to create stunningly effective, profile-building promotional projects that will win you work or boost your reputation. Elsewhere, leading design studio The Chase reveals how to craft better branding; and pro agencies explain how they keep on top of multiple projects, ensuring every client brief is completed on time and to budget. Also this month, the magazine kicks off a new 10-part series, which will culminate in its annual New Talent special issue next summer. Curated by D&AD New Blood trustee Tom Manning, the first article explores – with a humorous touch – what it takes to make it as a young designer in the modern design industry. Industry experts discuss: how far is too far when it comes to self-promotion? Great news: you can save up to 58% on the world's leading graphic design and illustration magazine – and get 20% off Adobe's Creative Cloud Photography Plan – with a subscription to Computer Arts. Simply head over to MyFavouriteMagazines and choose between the print, digital or special bundle subscription options.